sister projects: Wikipedia article, Commons category, definition, textbook, course. Microbiology is the study of microorganisms, which are microscopic, unicellular, and cell-cluster organisms. This includes eukaryotes such as fungi and protists, and prokaryotes. Viruses and prions, though not strictly classed as living organisms, are also studied. 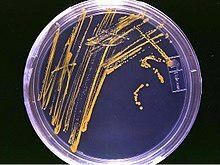 Microbiology typically includes the study of the immune system, or Immunology. Microbiology is a broad term which includes virology, mycology, parasitology, bacteriology and other branches. A microbiologist is a specialist in microbiology and these other topics.— Excerpted from Microbiology on Wikipedia, the free encyclopedia. "Fermentation and its Bearings on the Phenomena of Disease" in Popular Science Monthly, 10 (December 1876). "Micro-Organisms and their Effects in Nature" in Popular Science Monthly, 15 (October 1879). "On the Destruction of Infectious Germs" in Popular Science Monthly, 17 (October 1880). "Microscopic Life in the Air" in Popular Science Monthly, 23 (May 1883). "Tissue-Selection in the Genesis of Disease" in Popular Science Monthly, 27 (October 1885). "Tommasi-Crudeli on Malarious Countries, and their Reclamation" in Popular Science Monthly, 27 (October 1885). "The Microbes of Animal Diseases" in Popular Science Monthly, 29 (October 1886). "The Animal World of Well-Waters" in Popular Science Monthly, 35 (June 1889). "Mischief-Makers in Milk" in Popular Science Monthly, 35 (June 1889). "Invisible Assailants of Health" in Popular Science Monthly, 37 (October 1890). "Spontaneous Generation" in Popular Science Monthly, 2 (November 1872). "The Spontaneous-Generation Controversy" in Popular Science Monthly, 9 (August 1876). "Air-Germs and Spontaneous Generation" in Popular Science Monthly, 9 (May 1876). "Disease-Germs" in Popular Science Monthly, 20 (December 1881). "Progress of the Germ Theory of Disease" in Popular Science Monthly, 21 (August 1882). "The Germ-Theory of Disease" in Popular Science Monthly, 23 (September 1883). "The Cholera-Germ" in Popular Science Monthly, 25 (October 1884). "Bacteria and their Effects" in Popular Science Monthly, 6 (February 1875). "Toadstools and their Kindred" in Popular Science Monthly, 7 (June 1875). "Our Common Moulds" in Popular Science Monthly, 9 (August 1876). "About the Molds" in Popular Science Monthly, 21 (June 1882). "Mushroom," in The Encyclopedia Americana, New York: The Encyclopedia Americana Corporation (1906). "Ascomycetes," in The New Student's Reference Work, Chicago: F.E. Compton and Co. (1914). "Mycelium," in The New Student's Reference Work, Chicago: F.E. Compton and Co. (1914). "Mycorrhiza," in The New Student's Reference Work, Chicago: F.E. Compton and Co. (1914). "Yeast," in The New Student's Reference Work, Chicago: F.E. Compton and Co. (1914). "Yellow Fever" in Popular Science Monthly, 13 (October 1878). "Fever-Factories" in Popular Science Monthly, 14 (December 1878). "Inoculation Against Hydrophobia" in Popular Science Monthly, 28 (January 1886). "Huxley and Pasteur on the Prevention of Hydrophobia" in Popular Science Monthly, 35 (September 1889).